There are over 400 different varieties of holly plants. Some holly can grow into trees while others take a bush formation. 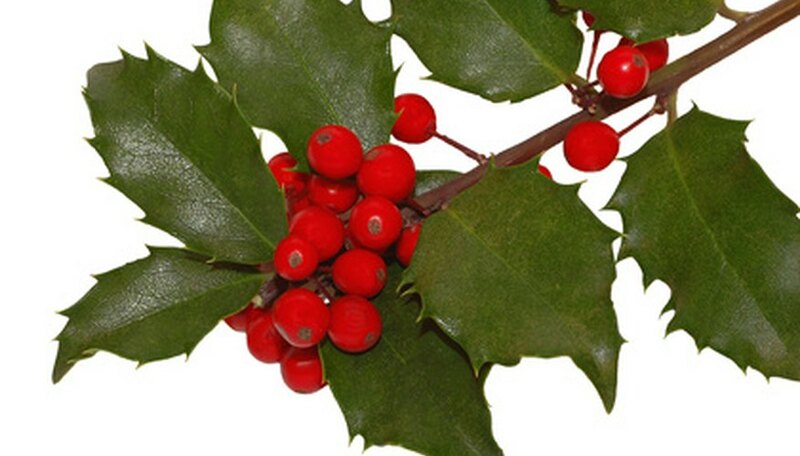 Identify holly bushes by looking at various parts of the plant. Common identification markings can be found in the leaf structure, berries, blossoms, shape and size of the plant. Certain holly bushes also bloom during specific seasons. Identify the type of holly bush by the leaves. English holly has dark green, glossy leaves with spiked tips. Blue holly leaves are a blueish-green with purple stems. Japanese holly has leaves similar to evergreen trees. Find dark green, leathery leaves longer than 3 inches on the American holly bush; these leaves also have small spines along the fringes. Look for dark green 4-inch-long leaves on the Chinese holly. The Emily Bruner variety has leaves reaching over 4 inches in length with 10 or 13 spines on each side of the leaf. Look at the berries. Bright red berries are found on English holly and Blue holly. Look for Chinese holly berries to have a range of color from red to dark orange to yellow. Japanese and Inkberry holly bushes have black berries. Notice the size of the holly. American holly can grow to 60 feet tall with a diameter of 35 feet. Chinese holly can reach heights of 15 feet with a 7-foot span. The Emily Bruner variety also reaches heights of 15 feet with an 8-foot span. Find out the type of holly bush by its shape. The American holly has an upright cone shape providing a pyramidal shade. Chinese holly, an evergreen bush with a medium to course texture, stands upright as a dense, rounded plant with multiple stems. Look for the evergreen Emily Bruner holly to have a pyramidal shape and dense, horizontal branches. Look at the flowers. Identify the American and Chinese holly by small white flowers less than an inch wide. Emily Bruner holly has large, bright red clusters of flowers. Make note of the season. The Chinese holly sprouts flowers in autumn. Look for red berries during the fall through late winter on the American holly.